Leon Theremin was a Russian scientist and inventor, who invented what was probably the first electronic instrument. 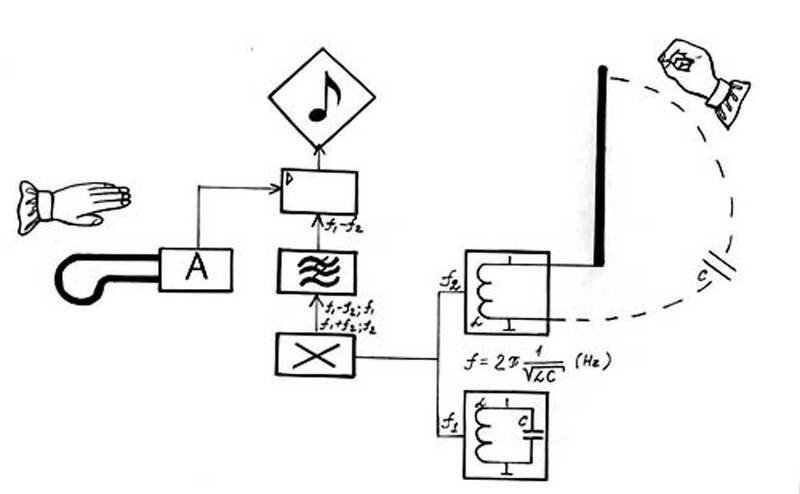 He was inspired by the idea that free-form gestures could become musical instruments (when moved in the electrical field of his instrument), and he also invented installation technologies that responded to dancers. A prolific inventor (he developed the first passive listening device or bug), he was nevertheless imprisoned by Stalin in 1938. He was reinstated as a USSR citizen in 1956. One of the first reactions to music that many of us experience is the mimicing of the act of conducting or of playing an instrument. Theremin capitalises on this in his ultimate air-guitar – a subtle and powerful instrument that responds to gesture. Along with his inventions of covert listening devices and motion-detectors as well as the Thereminovox, this makes Theremin the godfather of much intermedia and new media experimentation from the 1960s onwards. Versions of the Theremin were used to create the characteristic Startrek theme and Bob Whitsell’s Electro-Theremin featured in the Breach Boys’ Good Vibrations, and Wild Honey.